Now that the list, email alert, and email import have been created, the entire process can be tested. To use this action: create a new list item, set yourself as the approver, attach a document and set the status to “Review”. That will trigger an email alert to yourself. Once you have received the alert, reply back with “YES” and wait until the polling is complete (max 15 minutes). 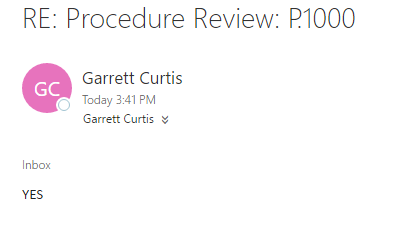 Step 1 – Create the new list item, attach a document, set the approver and change the status to “Review”. Now save the item, this will trigger the email alert and send an email to the Approver. Step 2 – Check your email for the email alert. 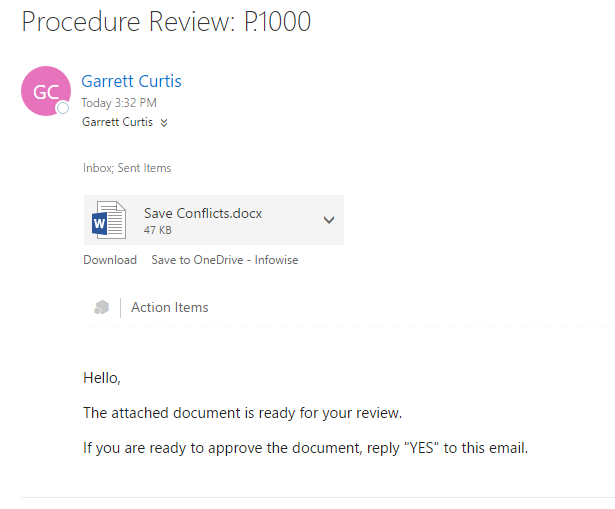 The document should be attached to the email for review. Step 3- Reply to the email with “YES” (that will satisfy the email import condition). Wait 15 minutes for the polling procedure to find the email. Step 4 – Check the email import history by going back to the Imports link on the Infowise Dashboard from the context of the Procedures list and selecting “Import History” for the profile. This is the log of the import action and will tell you if the action has succeeded or encountered any errors.